By visiting NickKidsChoiceAwardsSweeps.com between January 18 and February 12, you will have the opportunity to enter the Nickelodeon Kids’ Choice Awards Sweepstakes 2016 for a chance to experience the 2016 Kids’ Choice Awards in person. This year, country superstar and The Voice star Blake Shelton hosts the KCAs taking place on Saturday, March 12th. 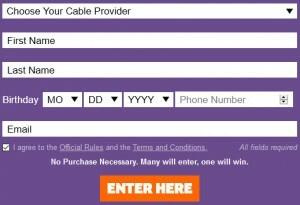 During the Sweepstakes Period, visit NickKidsChoiceAwardsSweeps.com to access the Nick Kids’ Choice Awards Sweepstakes 2016 entry form. Fill out the form as instructed by providing your cable provider, first name, last name, date of birth, phone number, and email address. Once completed, click the “Enter Button” to receive one entry into the sweepstakes. Alternatively, you may participate by sending a postcard or piece of paper no larger than 8½” x 11″ containing your full name, the name of the NCTC member cable system operator to which you subscribe, your complete mailing address, e-mail address, and phone number in an envelope via the U.S. Postal Service with proper postage affixed to: Hothouse, Inc. P.O. Box 5869, Atlanta, GA 30307. Regardless of method of entry, only one entry per participant per day is allowed throughout the Sweepstakes Period. Entries will be accepted between 12:00:01a.m. ET on Monday, January 18, 2016 and 11:59:59 p.m. ET on Friday, February 12, 2016.
be a valid subscriber of one (1) of the NCTC member cable system operators participating in the Sweepstakes at the time of entry. Please let me get picked cause my brother and think john cena is the best.